Please refer to our stock # 602 when inquiring. Sold ....thank you C. !! Pretty and rare all original French Poupee salon chair with silk upholstery and pillow ..... which is an typical furniture of the quality produced for luxury doll stores such " Au Paradis des Enfants " and " Au Nain Bleu " !!! The chair is shaped and carved of maple wood with lovely gold paper accents , has gracefully curved back and original silk upholstery with tufting buttons . Beautiful carved legs and silk trim decoration around the seat. Included an lovely little silk pillow with silk cord trim . 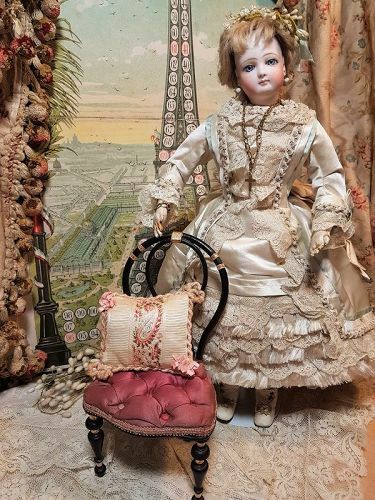 For special Paris luxury doll shop at around 1875 and a perfect accessory for your fashion doll salon !! Total high at back .... 9" ( 23 cm ) and seat high ..... circa 4" ( 10 cm ) Has generally excellent condition ! !